Our lab in the Center for Human Disease Modeling (CHDM) develops and deploys a broad range of in vitro and in vivo tools to understand the fundamental pathomechanisms of human genetic disease. 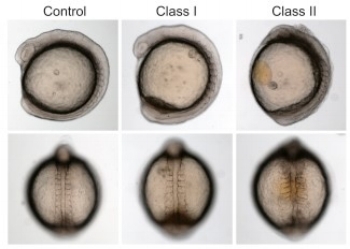 As part of that work, we have used zebrafish, mice, and human cells to generate ~ 650 models of human genetic disorders, with new tools and methods to study them developed iteratively. We have used these tools to measure the effect of genetic variation and its contribution to rare and common disease, to understand the complexity of the genetic architecture of such disorders, to dissect biochemical pathways, and to develop new drug screening paradigms. Although our studies fall under four broadly defined thematic areas outlined below, these are subject to substantial crosstalk, reflective of the overlapping interests of our faculty and of the multidisciplinary nature of the CHDM. Although each rare genetic disorder may be present in only a small number of individuals, together this group of disorders represents a major burden, with profound consequences to both families and the strained health care system. Structural birth defects, a significant fraction of which are underscored by genetic mutations, have been established consistently as the leading cause of mortality in the first postnatal year. The improved diagnosis and management of young children with pediatric genetic disorders is a high research priority for our Center. Although many major medical centers in the world employ next-generation sequencing paradigms as a first-pass diagnostic tool to uncover the genetic basis of ultra-rare disorders, our program layers functional analyses onto genome findings with a suite of zebrafish assays, cellular studies and, as necessary, mouse models, to determine biological relevance and variant pathogenicity. These models have emerged as powerful tools to both understand disease mechanism and also serve as novel platforms for therapeutic development. Our interest in rare congenital disorders is broad, but involves a prerequisite for structural organ defects whose phenotype can be captured quantitatively. We have focused on congenital anomalies of the kidney and urogenital tract, neuroanatomical defects in neonates and young children, contiguous gene syndromes (i.e., copy number varients), and the identification of suppressors as therapeutic targets. Through interactions and collaborations with academic colleagues, patient support groups, and partners from the pharmaceutical industry, we recruit and study the genetic architecture and pathomechanisms of patients with a variety of suspected genetic disorders. Disorders of the human nervous system have been dichotomized classically between early onset neurodevelopmental traits and later onset degenerative ones. However, as we understand the fundamental mechanisms of neurogenesis, renewal, and homeostasis, these “classical” lines are blurring and an emergent picture suggests a more complicated causality model across neurological disorders. One of the areas of focus in our lab is thus to understand how genetic variation can impact the development and homeostasis of the nervous system. As part of this work, we have developed animal and cellular models to study basic neurodevelopmental processes, to discover new genes and alleles that contribute to neurodevelopmental and neurodegenerative disorders in humans, and to enable the development of rational therapeutic paradigms. Some of the disorders on which we have focused include autism, neural tube defects, neuromuscular disorders, post-traumatic stress disorder, schizophrenia, and rare neuroanatomical defects in neonates and young children. Cilia are conserved cellular structures that are nearly ubiquitous in the vertebrate body plan. Although first reported by Antonie van Leeuwenhoek over 200 years ago, it was not until the turn of the 21st century that the extensive roles of this complex cellular structure emerged. Through highly collaborative efforts of many laboratories worldwide, we and others have demonstrated that cilia are key mediators of extracellular cues such as morphogenetic signaling that are critical to proper development and homeostasis. We now know that a repertoire of ~1,000 proteins, the ciliary proteome, are required for correct ciliogenesis and ciliary function, and it is therefore not surprising that disruption of any one of these components can give rise to human genetic disorders termed ciliopathies. Our researchers have a long-standing interest in understanding the genetic architecture of these clinically distinct but overlapping disorders, and in the mechanistic dissection of ciliary function in discrete spatiotemporal contexts. Our long-term goal is to develop novel therapeutic strategies aimed to ameliorate or at least prolong the onset of symptoms. The evolution of genomic technologies has had a profound effect on the tractability of the genetic basis of complex traits. Most notably, high-density genotyping and now genome sequencing have mapped thousands of risk loci for complex traits. However, the transition from association to causality has remained challenging, largely bereft of experimentally tractable solutions. Our lab, in addition to participating in large consortia association studies, has placed heavy emphasis on the development of conceptual and technical tools to identify penetrant coding variants and biological mechanisms for several complex traits. These conditions include autism, complex ocular disorders, sickle cell disease, post-traumatic stress disorder, and schizophrenia. Ta-Shma A, Khan TN, Vivante A, Willer JR, Matak P, Jalas C, Pode-Shakked B, Salem Y, Anikster Y, Hildebrandt F, Katsanis N, Elpeleg O, Davis EE. (2017). Mutations in TMEM260 Cause a Pediatric Neurodevelopmental, Cardiac, and Renal Syndrome. Am J Hum Genet. 11. pii: S0002-9297(17)30074-5. Goetz SC, Bangs F, Barrington CL, Katsanis N, Anderson KV. (2017). The Meckel syndrome- associated protein MKS1 functionally interacts with components of the BBSome and IFT complexes to mediate ciliary trafficking and hedgehog signaling. PLoS One. 14;12(3):e0173399. Tan PL, Garrett ME, Willer JR, Campochiaro PA, Campochiaro B, Zack DJ, Ashley-Koch AE, Katsanis N. (2017). Systematic Functional Testing of Rare Variants: Contributions of CFI to Age-Related Macular Degeneration. Invest Ophthalmol Vis Sci. 58(3):1570-1576. Küry S, Besnard T, Ebstein F, Khan TN, Gambin T, Douglas J, Bacino CA, Sanders SJ, Lehmann A, Latypova X, Khan K, Pacault M, Sacharow S, Glaser K, Bieth E, Perrin-Sabourin L, Jacquemont ML, Cho MT, Roeder E, Denommé-Pichon AS, Monaghan KG, Yuan B, Xia F, Simon S, Bonneau D, Parent P, Gilbert-Dussardier B, Odent S, Toutain A, Pasquier L, Barbouth D, Shaw CA, Patel A, Smith JL, Bi W, Schmitt S, Deb W, Nizon M, Mercier S, Vincent M, Rooryck C, Malan V, Briceño I, Gómez A, Nugent KM, Gibson JB, Cogné B, Lupski JR, Stessman HA, Eichler EE, Retterer K, Yang Y, Redon R, Katsanis N, Rosenfeld JA, Kloetzel PM, Golzio C, Bézieau S, Stankiewicz P, Isidor B. (2017). De Novo Disruption of the Proteasome Regulatory Subunit PSMD12 Causes a Syndromic Neurodevelopmental Disorder. Am J Hum Genet. 2;100(2):352-363. Puri P, Barton D, Casolari E, Furth SL, Warady BA, Gucev Z, Hakonarson H, Flogelova H, Tasic V, Latos-Bielenska A, Materna-Kiryluk A, Allegri L, Wong CS, Drummond IA, D'Agati V, Imamoto A, Barasch JM, Hildebrandt F, Kiryluk K, Lifton RP, Morrow BE, Jeanpierre C, Papaioannou VE, Ghiggeri GM, Gharavi AG, Katsanis N, Sanna-Cherchi S. (2017). Genetic Drivers of Kidney Defects in the DiGeorge Syndrome. N Engl J Med. 23;376(8):742-754. JM Jr, Lin AE, Katsanis N, Jones PL, Crowley WF Jr, Davis EE, FitzPatrick DR, Talkowski ME. (2017). SMCHD1 mutations associated with a rare muscular dystrophy can also cause isolated arhinia and Bosma arhinia microphthalmia syndrome. Nat Genet. 49(2):238-248.